Are you wondering how your business can be more useful? 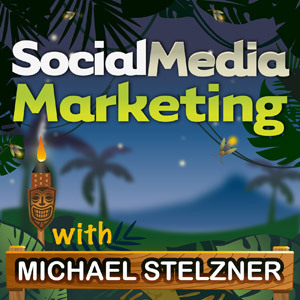 To learn about youtility and a new way of thinking when it comes to marketing, I interview Jay Baer for this episode of the Social Media Marketing podcast. Jay shares the many different ways companies are already providing youtility to their customers. You’ll learn the three categories of being useful and how to implement them into your business. What’s changing marketing that everybody needs to understand? Jay believes that marketing is harder than ever. With the incredible growth in the number of media outlets, it makes it very difficult to achieve top of mind awareness in the ways that we used to be able to do. Blogs and podcasts didn’t exist before, but today they have huge audiences. Companies now have to compete for attention—not just against other companies, but against everybody and everything. Jay explains that if you take a look at your Facebook news feed, Twitter account or email inbox, you’ll find a combination of both personal and professional relationships. Companies are competing for attention with consumers’ friends and family members and are forced to use the same technologies to get on their radar. Twitter is a place used for both personal and business relationships. Since 1994, Jay has worked online and remembers how people freaked out when they bought advertising on the web for the first time. He says at the end of the day, all these things are almost free, but somebody has got to pay the free. The guys who pay the free are businesses. Listen to the show to find out what you need to do to succeed against everyone and everything. Jay talks about certain people who are an exception to the rule when it comes to being amazing. But he feels that most of us aren’t amazing. So the best approach for us all is to be useful. You need to create youtility. Jay defines youtility in his book as marketing that is so useful, people would want to pay for it. Jay shares the story of Hilton Hotels’ program called Hilton Suggests on Twitter and how the program came about. Hilton Suggests provides awesome youtility on Twitter. You’ll hear a great example of how they helped a guy on Twitter who was looking for a vet in the area. They helped him when he needed it most, and this will probably lead to him booking a Hilton hotel in the future. Jay says the difference between helping and selling is just two letters, but in modern business those two letters make all the difference. At a recent conference, Jay heard Gary Vaynerchuk say, “Everybody wants to be a hunter, but nobody wants to be a farmer.” Youtility is about long-term play. If you sell something, you make a customer today. But if you help someone, you can create a customer for life. You need to start to think about marketing, customer acquisition, loyalty and retention over a longer time horizon. You’ll hear why Jay wishes that more businesses were less self-serving and more useful. Listen to the show to hear how Columbia Sportswear uses indirect marketing and provides youtility to their customers. Jay says you wouldn’t necessarily charge for youtility because it’s marketing. It’s about trying to build a brand and make connections with customers and prospective customers over the long haul. There are certain circumstances where there is a fee with youtility but it’s very rare. It has to be so inherently useful that you would pay for it. Youtility is marketing that people want, as opposed to marketing that brands and companies think they need. Listen to the show to find out why the word marketing almost means content. Jay gives a high-level overview of the three elements of being useful. Self-service information. It used to be that customers didn’t need to know the facts. Today they want all the information. Being the middleman and keeping the information hidden is dead. Jay says that youtility is timely as a marketing framework, because this is the year we cross the chasm. This year in the US alone, smartphone penetration will be up to 57%. This means that most of your customers have access to everything. You’ll have to give them more information, otherwise they will go elsewhere. Radical transparency. Your customers will always have a lot of questions about you, your products and services. The best way to start with youtility is by answering these questions. You’ll hear how this helped Marcus Sheridan at River Pools and Spas grow his business in incredible ways. Real-time relevancy. Nobody is a youtility all the time. Your customers’ needs change. You need to be so useful that when they need you, you’re there. You’ll hear Jay give an example of how Vanderbilt Hospital in Nashville uses real-time relevancy with their mobile app called CoachSmart. 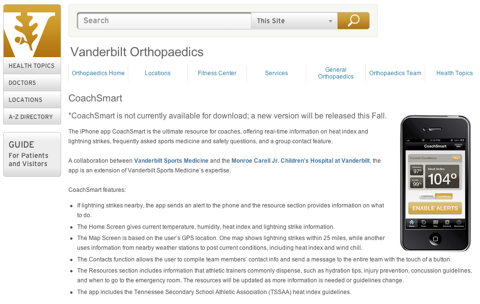 Vanderbilt Hospital's mobile app CoachSmart provides youtility with real-time relevancy. There are other ways to create youtility without having a phone app. 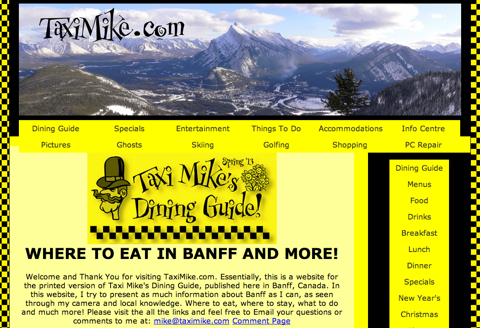 One of Jay’s favorite examples for small businesses is Taxi Mike, who is a cab driver in Banff, Alberta. Although there are tons of taxi drivers in Banff, Mike is the only driver who provides youtility. You’ll hear how he does this for tourists and how it drives business back to him. Taxi Mike provides youtility to tourists in Banff. Listen to the show to hear how IKEA in Montreal provides offline utility. Jay talks about how in the book Youtility, they have a 6-step process on how to create youtility for either an individual, small business or large company. The first step is to transcend the transaction and think about how you can solve your customers’ or prospective customers’ needs or problems. It’s not typically your products or services, but something related to their lifestyle. The best way to find out this information is to see what people are searching for. Take a look at your web analytics and social media channels to see what people are talking about. Another way to understand your customers’ needs is to talk to them. Jay explains why he worries about companies who use data instead of talking to their customers. Listen to the show to hear how Vanderbilt Hospital came up with the idea for the CoachSmart app. Jay says youtility fits into all of the various channels and there are examples of each in his book. In some cases, it’s not about the right or the wrong way to do it—there are just some ways that are a little bit more right. Phoenix Children’s Hospital created a mobile app called Car Seat Helper. They could have provided this youtility through a blog, a podcast or an ebook, but instead they chose to build a mobile app from a PDF. Phoenix Children's Hospital's Car Seat Helper app. You’ll hear why they chose this medium over all of the other channels available. Jay shares why you don’t need to be crazy or completely innovative to stand out in this noisy time that we’re in right now. All you need to do is be really, really helpful. One of the reasons why youtility is so important today is that social would be better for everybody if it was used to promote useful things, rather than for self-promotion. 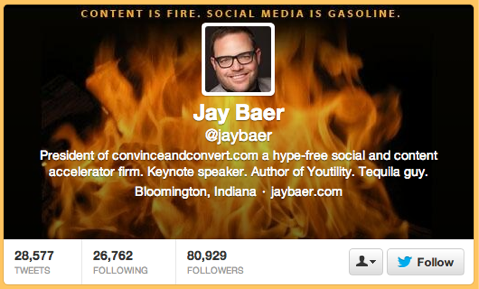 Listen to the show to hear why content is fire and social is gasoline. Before Social Media Examiner, I used to be known as a white paper guy. My very first book was called Writing White Papers. A good friend of mine, Gordon Graham, has recently released an awesome new book called White Papers for Dummies. I strongly recommend this book. It’s an extremely detailed, up-to-date book on how to write and create white papers. You’ll hear what a white paper is (if you don’t know already) and how it can help with exposure and lead generation. Over the last three episodes, I’ve done a step-by-step guide on how to launch a product and/or company. In this show, I want to focus on how to go from an interest level to commitment and how to go from commitment to action. I’m using My Kids’ Adventures as an example, so that you can understand the processes we are going through in preparation for this launch. Once we made phone contact with the people who had signed up wanting to help, the next step was to send them to a special form. You’ll hear what the form included and what we did with that information. The idea behind the form is to make potential contributors think about what they are being asked to do and it gives you an equal comparison of all the different applicants. The next step is to get a commitment from them. You’ll hear what language we used to get the commitment and the ability to take things to the next level. The result has been phenomenal. The take-home lesson is to set the bar very high, provide clear instructions and people will deliver. In the next episode, I’ll talk about how we got everybody excited for the upcoming launch of My Kids’ Adventures and share with you some of our marketing techniques. If you want to learn more about My Kid’s Adventures, visit here. Connect with Jay Baer on his website. 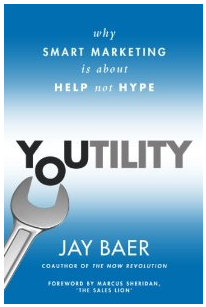 Take a look at Jay’s books: Youtility: Why Smart Marketing Is About Help Not Hype and The Now Revolution. 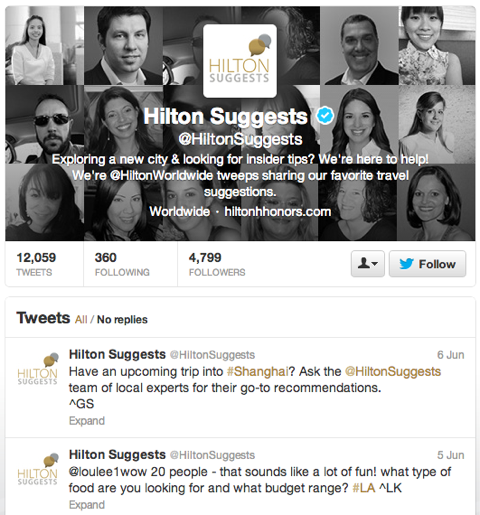 Check out how Hilton Suggests offers utility on Twitter. Look at Columbia Sportswear’s mobile app: What Knot to Do in the Great Outdoors. Head over to River Pools and Spas to see how they grew their business with utility. See how Vanderbilt Hospital uses real-time relevancy with their mobile app, CoachSmart. Read more about Taxi Mike. 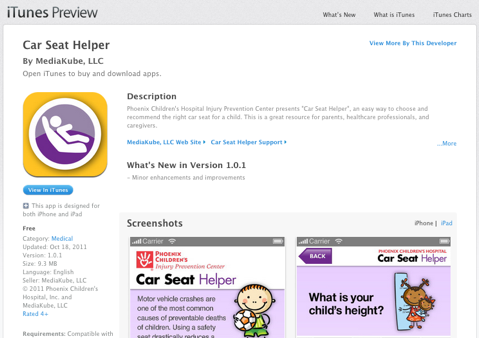 Check out Phoenix Children’s Hospital‘s mobile app called Car Seat Helper. Take a look at Gordon Graham’s book: White Papers for Dummies. What do you think? What are your thoughts on creating utility for your customers? Please leave your comments below.